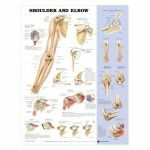 Lake Forest Anatomicals has the highest quality shoulder joint anatomical wall charts in the industry. We offer low prices and fast delivery. Great for student teaching and medical schools.